This 9/11 week, I want to focus on a phenomenon I call "9/11 Denial". For this post, I'd like to start with that Democrat Newspaper: The New York Times - which believes that we should all get over 9/11! In 2018, the NYT blamed 9/11 for "How Our Sports Got So Divisive" (by ESPN's Howard Bryant). And Thomas Friedman wrote a piece titled "9/11 is OVER!" ISIS and Charlie Hebdo prove otherwise. (there is no need to waste your time reading their 9/11 denial articles; I just listed them as proof of how vile their party is. which deserves retribution when we choose our representatives). This year, remember the victims, but never forget the people who want to forget the victims. I will post again on this issue soon, focusing on a different category of denier. stay tuned. The left has all but ignored the 17th anniversary of 9/11 this year. While Trump was speaking in Pennsylvania, and Pence at the Pentagon, the rest of the MSM was concentrating their coverage on the mid-term elections. CNN dubbed their coverage "America's Choice" even though they have tried for two years to undermine 2016 America's Choice. Yahoo posted an article that "Trump still can't strike the right note about 9/11." They complained about a tweet that pointed out how long it had been since 9/11, and a double first pump when he arrived. Trump just can't win with Liberals. No left turn on Red, White and Blue!!! 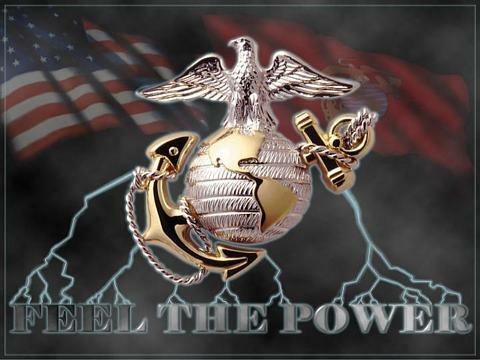 Once a Marine, always a Marine!!! None other than MSNBC used to show the news coverage in real time of 9/11/. It is as if they would like us to forget it happened and WHY it happened. We were stunned that there was so much hate for us. Overall, we knew very little about the commands of Islam to destroy we, the infidels. We didn't know it was done right under our noses, taking advantage of our systems. More stunning is that there was no BAN on the religion of peace followers from coming into the country. We were lectured on not believing ALL were terrorists, yet we saw no real support or sympathy. Just another example of liberalism as a mental disorder. They most certainly did ignore it. Just in a microcosm but admin's other board did not acknowledge it until I started a thread close to 6 PM on 9/11. I wanted to see who would remember. No one apparently did. Sad. Trump tried to stop the Muslims from coming to the USA but the Liberal Judges shot that down. Things have gotten so bad now, I believe the Libs have gotten in enough to accomplish their goals, what ever that might be. Wow. Yahoo is complaining about the "right note" by Trump yet their other Democrat paper (NYT) writes an article blaming 9/11 Tributes for why sports are so divisive. hypocritical and sick. Howard Bryant is a racist liberal writer. his NYT article isn't the first time he ranted against 9/11 tributes. he did it when he wrote for ESPN. The left has all but ignored the 17th anniversary of 9/11 this year. And ignoring an event is a form of denial. they act as if it never happened. -Those who deny that an event took place. (Democrat newspapers like the New York Times, ESPN magazine). In the next few days I will be posting a "9/11 Denier of the Day" post whenever I can. I hope you all find it interesting. 9/11 is a reminder of the War on Terror; and liberals don't want to be reminded that it exists. This is why they are "9/11 deniers". ISIS and Charlie Hebdo were a huge stomp on their heads.